Presenting, Vijaydeepas KTVR Olive Grace - an address that is an oasis of calm, peace and magnificence in the hustle-bustle of the city, Coimbatore. Your home will now serve as a perfect getaway after a tiring day at work, as Vijaydeepas KTVR Olive Grace ambiance will make you forget that you are in the heart of the city, Saibaba Colony. Vijaydeepas KTVR Olive Grace is a large project spread over an area of 0.30 acres. 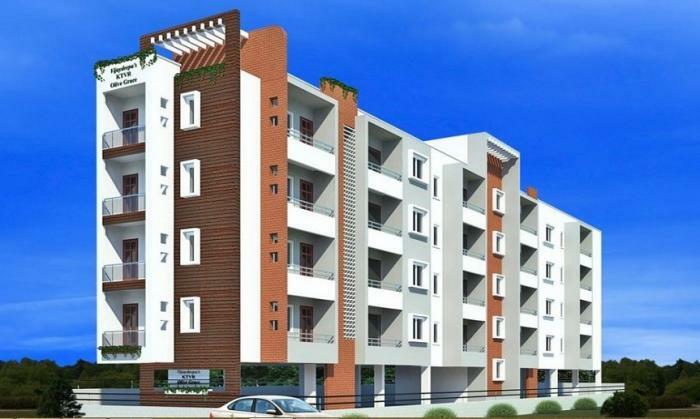 Vijaydeepas KTVR Olive Grace comprises of 3 BHK Apartments in Coimbatore. Vijaydeepas KTVR Olive Grace brings a lifestyle that befits Royalty with the batch of magnificent Apartments at Saibaba Colony. These Residential Apartments in Coimbatore offers limited edition luxury boutique houses that amazingly escapes the noise of the city center. Vijaydeepas KTVR Olive Grace is built by a renowned name in construction business, KTVR Vijaydeepa Group at Saibaba Colony, Coimbatore. The floor plan of Vijaydeepas KTVR Olive Grace presents the most exciting and dynamic floor plans designed for a lavish lifestyle. The master plan of Vijaydeepas KTVR Olive Grace offers people a strong connection to their surroundings, promoting a sense of community whilst balancing this with a distinct private address for individual homeowners. Amenities: Out of the many world class facilities, the major amenities in Vijaydeepas KTVR Olive Grace includes Intercom, Lift, Car Parking, Gated community, Eco Friendly and Security. Location Advantage: There are number of benefits of living in Apartments with a good locality. The location of Vijaydeepas KTVR Olive Grace makes sure that the home-seekers are choosing the right Apartments for themselves. It is one of the most prestigious address of Coimbatore with many facilities and utilities nearby Saibaba Colony. Address: The complete address of Vijaydeepas KTVR Olive Grace is Saibaba Colony, Bharathipark, Cross-1, Coimbatore, Tamil Nadu, INDIA..
Shri K T Venkatarama Reddy, is the Founder of KTVR Vijaydeepa Group. He was also the Founder Chairman of the Builders Association of India - Coimbatore Centre. V.Loganathan, a Civil Engineer with more than 35 years of Experience in the construction industry, is the Managing Director. He was awarded the UDYOGH RATTAN by Institute of Economic Studies for his excellence in construction. He ensures that each and every work executed in the construction site is of at most quality and precision. "KTVR Vijaydeepa Group is the pioneer to introduce Flats in Coimbatore during the year 1980. For more than 6 decades, KTVR Vijaydeepa Group has associated itself with many prestigious landmarks of the city. By introducing the concept of ownership apartments for the first time in Coimbatore, the Group added a new dimension to the real estate business. The profound expertise in the construction domain helps KTVR Vijaydeepa Group to promote, develop and construct ownership flats. Best Quality, Superior Finishing and prompt Service are the Factors that set KTVR Vijaydeepa Group apart form others in this field. KTVR Vijaydeepa Group with its state of art infrastructure, and in-house team of high skilled workmen for carrying out all construction related works, under the supervision of the companys Directors personally, adds to the conviction that people have placed on Group." Srinivas Loganathan, a Civil Engineer with Masters in Construction Management form UK, is the Executive Director. He implements the state of art technology, in the construction and executes the work, ensuring the projects are completed in (Superior Quality), within Budget (Cost) and within prescribed time frame (Time). Prathipa, an Architect with more than 10 Years Experience, is the Architect for the Group and also the Managing Director of Prathipas Architect Design. She provides the aesthetics and charm to all Buildings. Innovative Space Saving, Natural Ventilation Design & Concept of hers, completely gives a new experience to all our Clients. Review of Vijaydeepas KTVR Olive Grace, Saibaba Colony? Its price, location, builder etc. Review of Ktvr Vijaydeepa Group, Saibaba Colony? construction quality, trustworthy, delivery history etc.? Review of Vijaydeepas KTVR Olive Grace, Saibaba Colony location? neighbourhood, connectivity, schools etc.? Comparison of Vijaydeepas KTVR Olive Grace, Saibaba Colony to nearby projects? Is it rightly priced? What is your feedback on this Vijaydeepas KTVR Olive Grace, Saibaba Colony? Depends on brand name and complete the project in time etc? Will this be a better option for investment or to live in Vijaydeepas KTVR Olive Grace, Saibaba Colony? Can you give some suggestion? Is the Vijaydeepas KTVR Olive Grace, Saibaba Colony has more potential in terms of capital appreciation, ROI, Rentals, Proximity to social infrastructure etc?